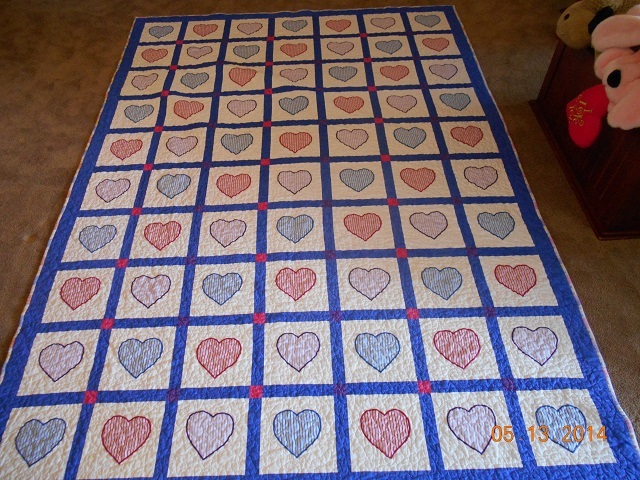 Here is a picture of a memory quilt my nephew's mother in law made for him from his mothers pajamas. She brought it to him this last weekend just before Mother's Day. (My sister passed away in 2005) This quilt means so much to him and I almost cried when I saw it. What a blessing! beautiful and oh the memories. What a lovely idea and a beautiful memory! What a nice thing for her to do. I would have cried too. I almost did as it is. Beautiful quilt! Wonderful way to keep her with him! Beautiful quilt and full of memories for him! Very nice thing for his MIL to do for him! Just lovely. What a great idea to use PJs. I'm making a memory quilt for my grandsons. My daughter passed this January. Very pretty quilt and a sweet memory for him to have. What a great thing for her to do, and a wonderful memory for him. Very pretty quilt. He will treasure it. Beautiful quilt and wonderful story. Truly a treasure!! So thoughtful and what a caring gift of heart. What an awesome idea. I am sure it will bring him comfort. It's beautiful, and I love the hearts. I'm sure he will treasure it always. That will be so nice for him to cuddle with. What a wonderful gift. A beautiful quilt and one he will cherish.